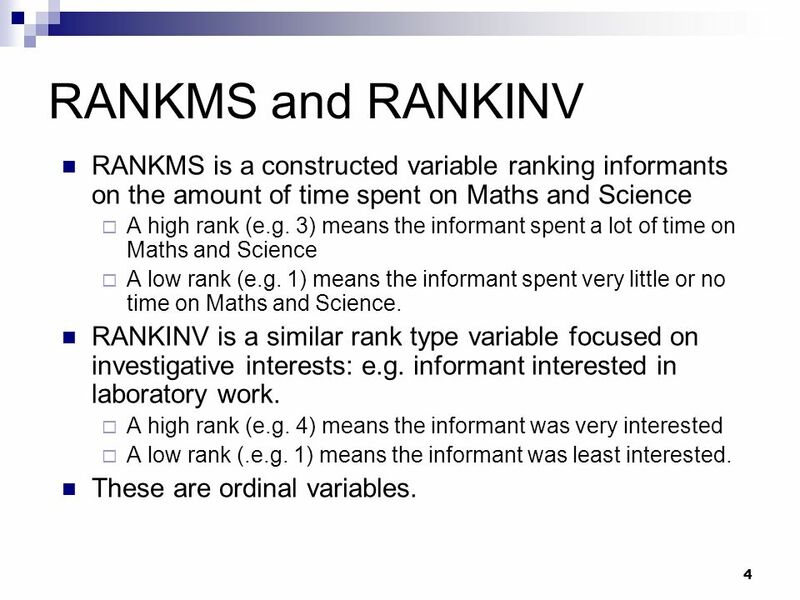 4 RANKMS and RANKINV RANKMS is a constructed variable ranking informants on the amount of time spent on Maths and Science A high rank (e.g. 3) means the informant spent a lot of time on Maths and Science A low rank (e.g. 1) means the informant spent very little or no time on Maths and Science. 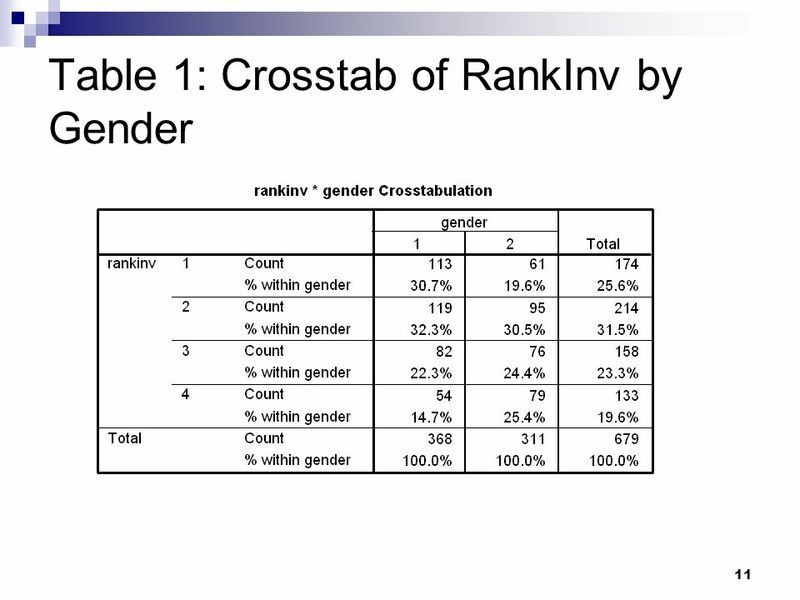 RANKINV is a similar rank type variable focused on investigative interests: e.g. informant interested in laboratory work. A high rank (e.g. 4) means the informant was very interested A low rank (.e.g. 1) means the informant was least interested. 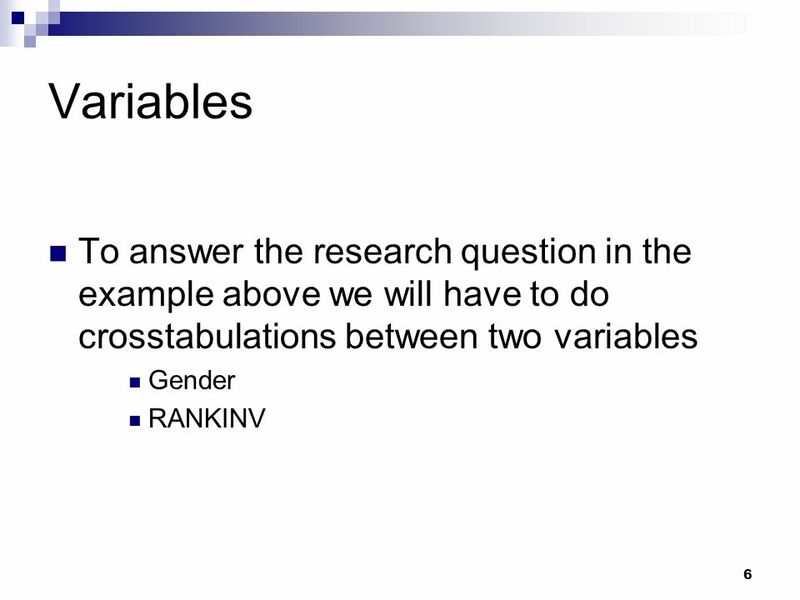 These are ordinal variables. 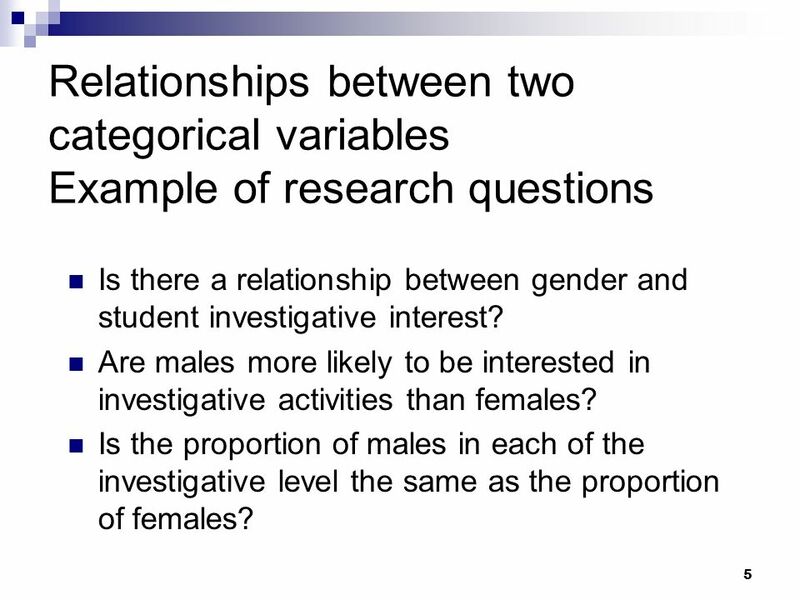 Is there a relationship between gender and student investigative interest? 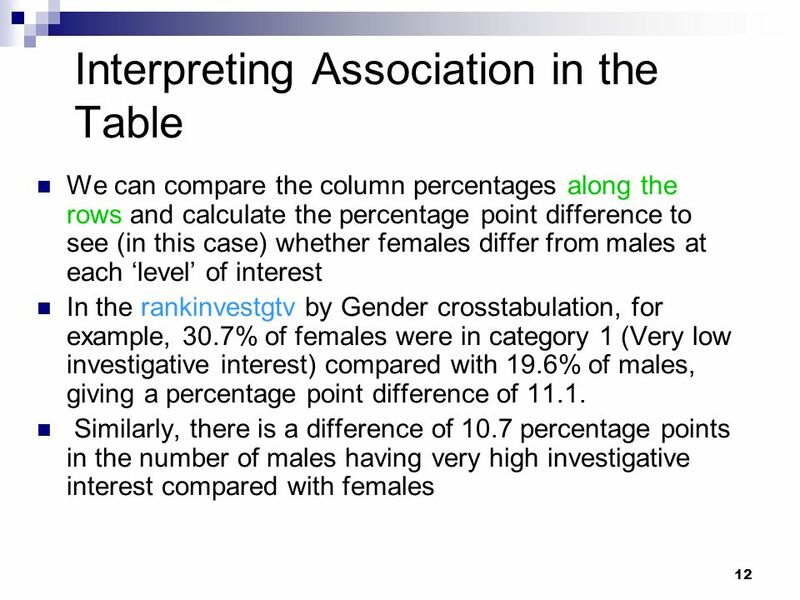 Are males more likely to be interested in investigative activities than females? 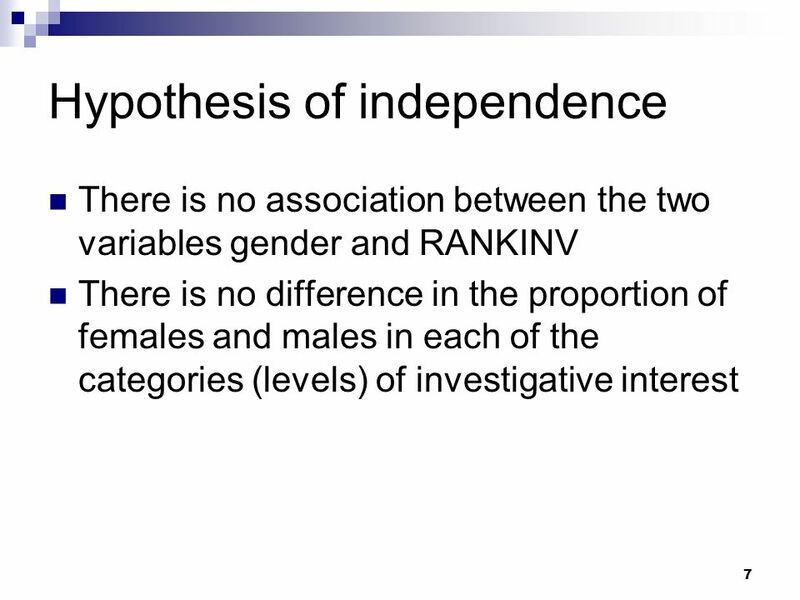 Is the proportion of males in each of the investigative level the same as the proportion of females? 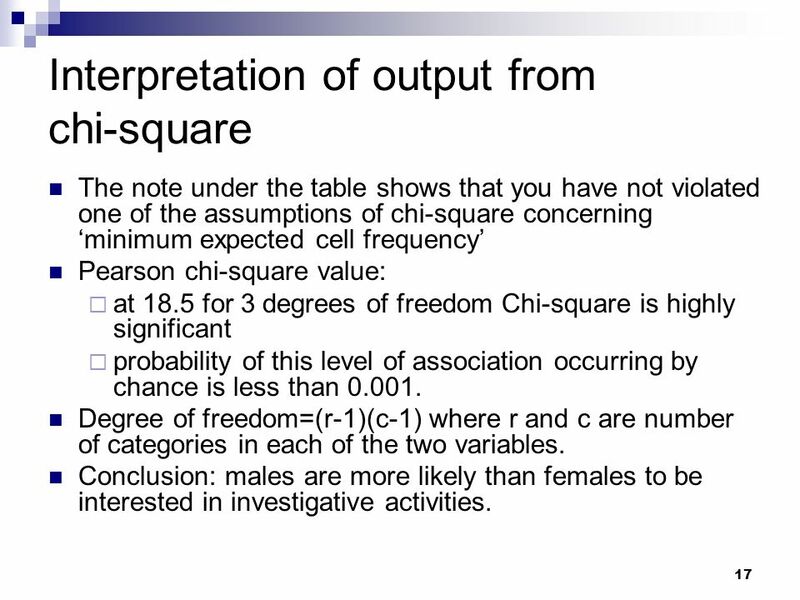 The note under the table shows that you have not violated one of the assumptions of chi-square concerning ‘minimum expected cell frequency’ Pearson chi-square value: at 18.5 for 3 degrees of freedom Chi-square is highly significant probability of this level of association occurring by chance is less than Degree of freedom=(r-1)(c-1) where r and c are number of categories in each of the two variables. 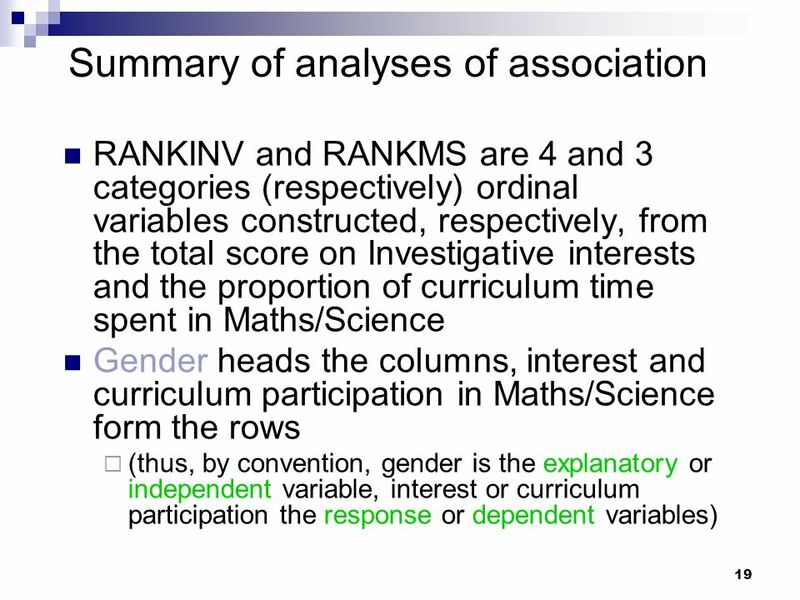 Conclusion: males are more likely than females to be interested in investigative activities. 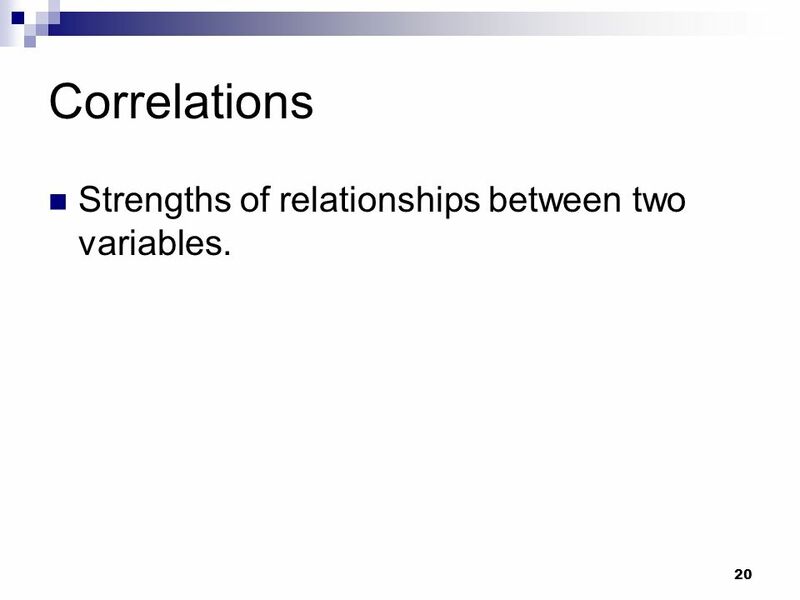 20 Correlations Strengths of relationships between two variables. 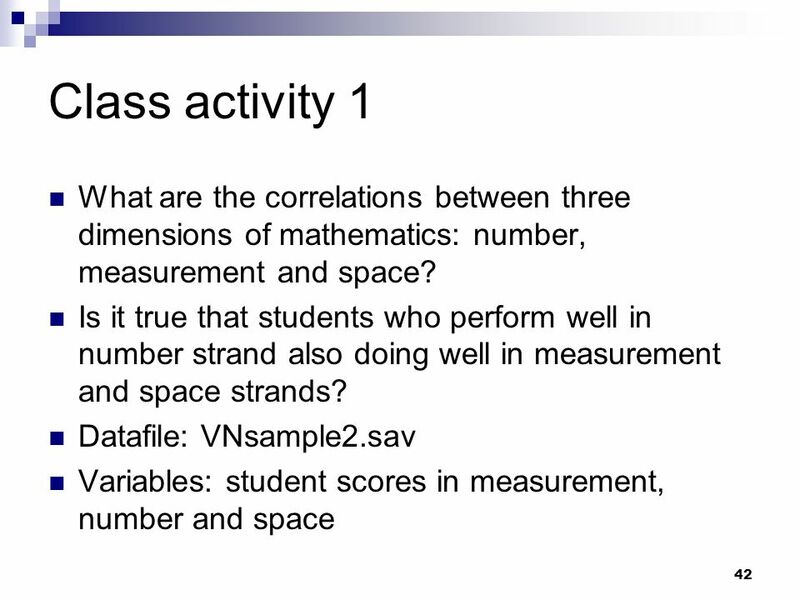 Is there a relationship between student achievement in mathematics and English language? Is there a relationship between parents’ incomes and children VCE results ? 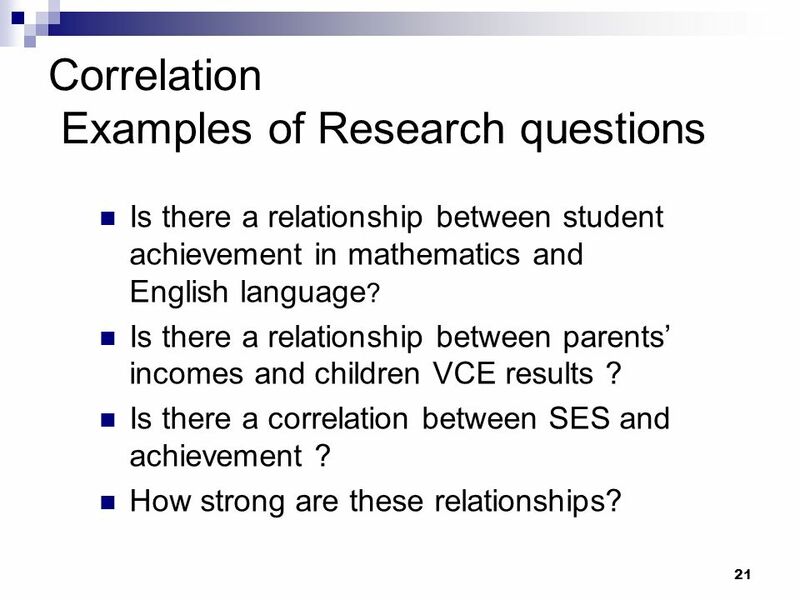 Is there a correlation between SES and achievement ? How strong are these relationships? These research questions required us to explore the dependency between two variables. 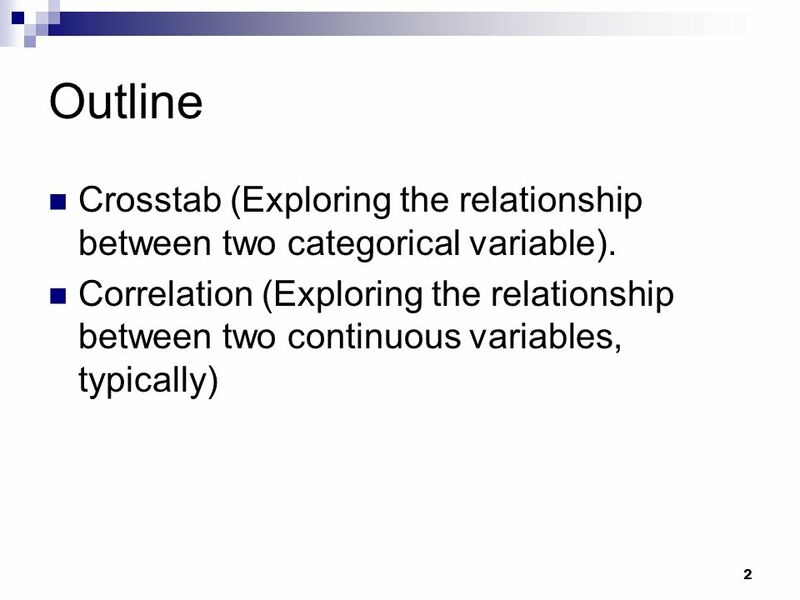 What we need here are: two continuous variables (VCE results, incomes) or one dichotomous variable and one continuous variable. It is accepted that one of the variables are ordinal. However, when at least one of the variables ordinal, Spearman’s rho or Kendall’s tau should be used. 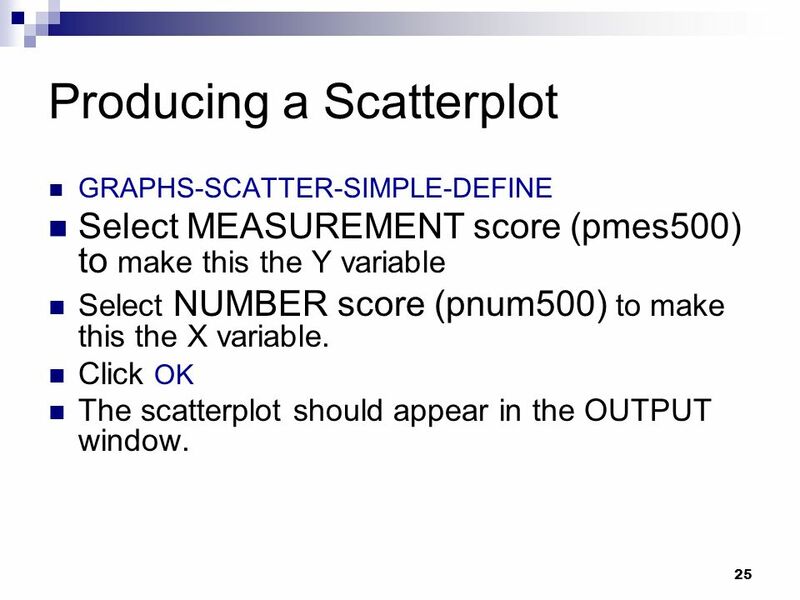 GRAPHS-SCATTER-SIMPLE-DEFINE Select MEASUREMENT score (pmes500) to make this the Y variable Select NUMBER score (pnum500) to make this the X variable. 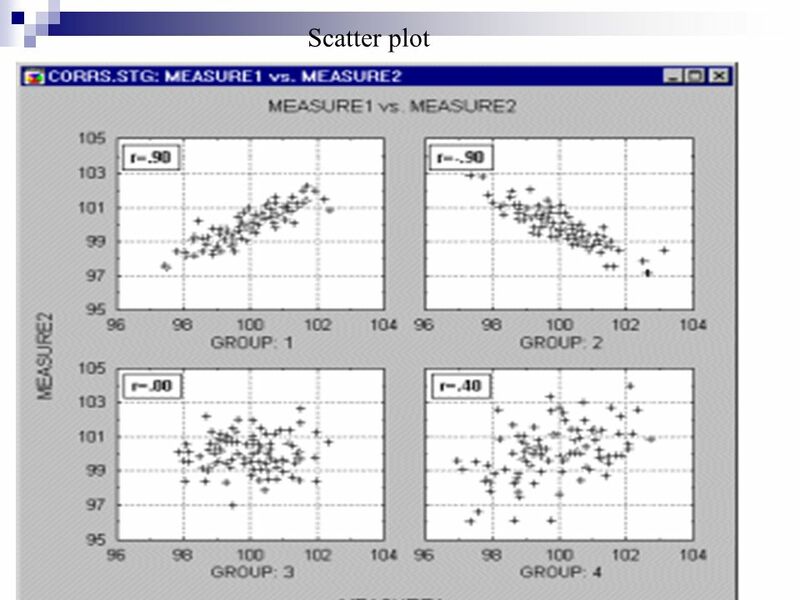 Click OK The scatterplot should appear in the OUTPUT window. 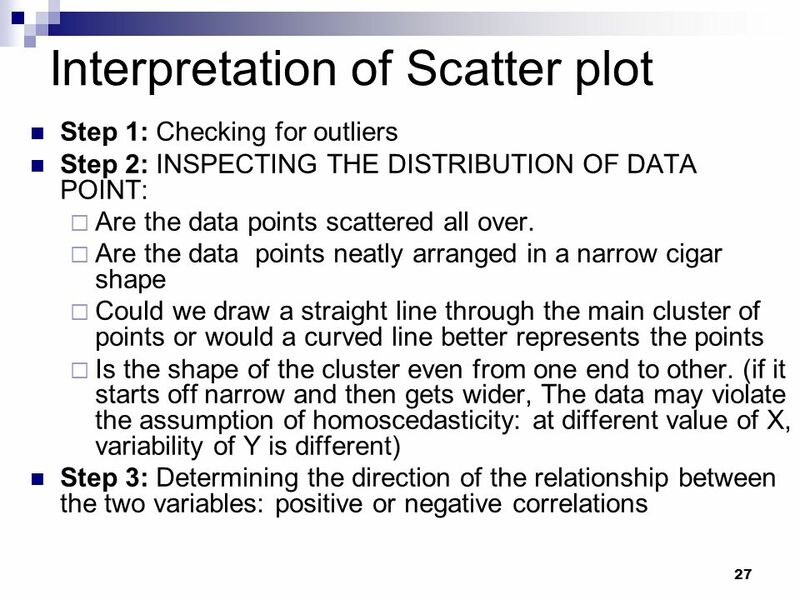 26 Scatter plot Interpret these points to understand scatter plot. 28 Direct Relationship When values on two variables tend to go in the same direction, we call this a direct relationship. The correlation between children’s ages and heights is a direct relationship. That is, older children tend to be taller than younger children. 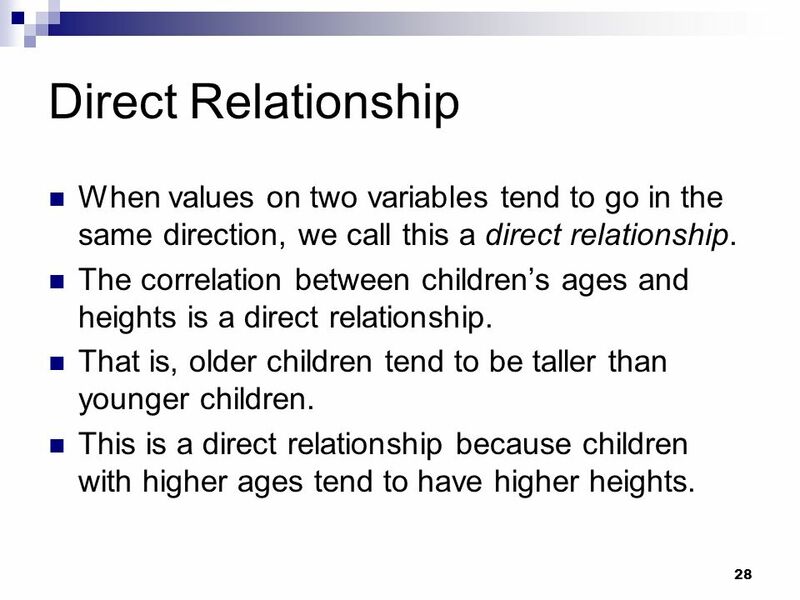 This is a direct relationship because children with higher ages tend to have higher heights. 29 Inverse Relationship When values on two variables tend to go in opposite directions, we call this an inverse relationship. 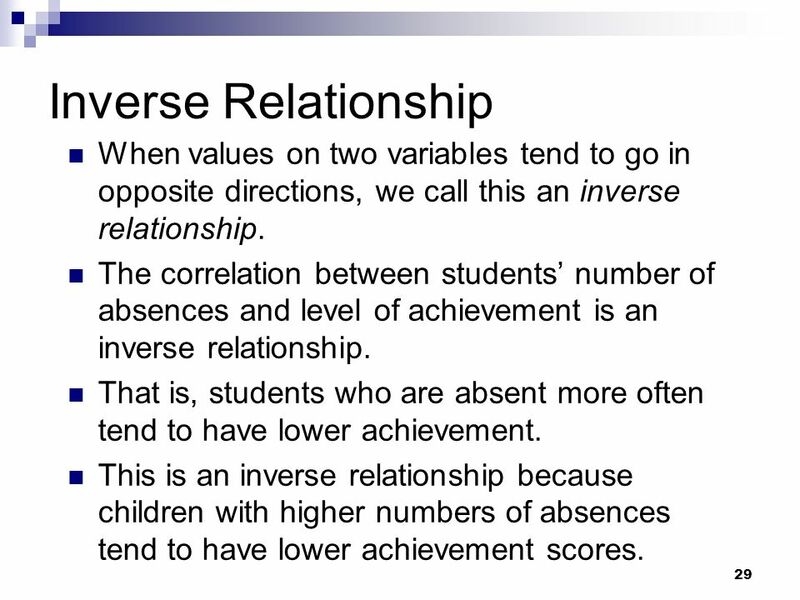 The correlation between students’ number of absences and level of achievement is an inverse relationship. That is, students who are absent more often tend to have lower achievement. This is an inverse relationship because children with higher numbers of absences tend to have lower achievement scores. 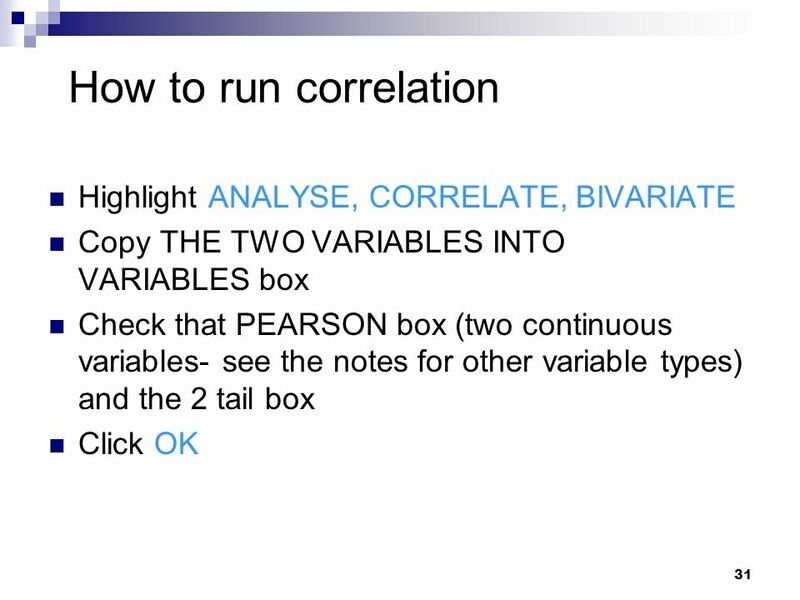 Copy THE TWO VARIABLES INTO VARIABLES box Check that PEARSON box (two continuous variables- see the notes for other variable types) and the 2 tail box Click OK Note when at least one of the variables ordinal Spearman’s rho or Kendall’s tau should be used. There for you should tick on the boxes next to them. Kendall’s tau usually produces a slightly smaller correlations. Rho is more commonly used and reported by researchers. 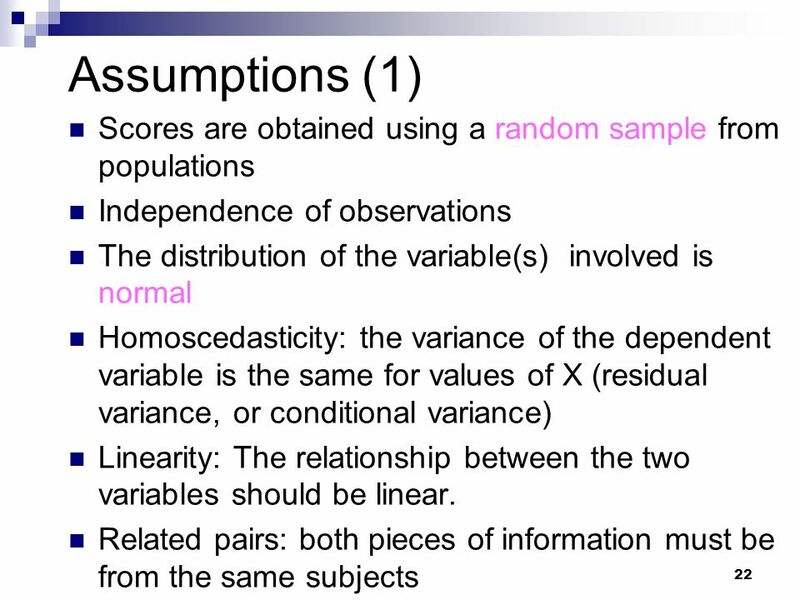 However, only use these alternatives when you cannot meet the assumptions of Pearson’s r .
This is correlation coefficient (r) This is the p value Number of cases Step 1: Checking information about sample size Step 2: Determining the directions and strengths of the relationships Step 3:Calculating the coefficient of determination (r2) Step 4: Assessing the significance Here you can see the number of CASES , the correlation coefficient (R). Pearson’s correlation coefficient shows the degree to which two variables are related linearly (i.e., a straight line). 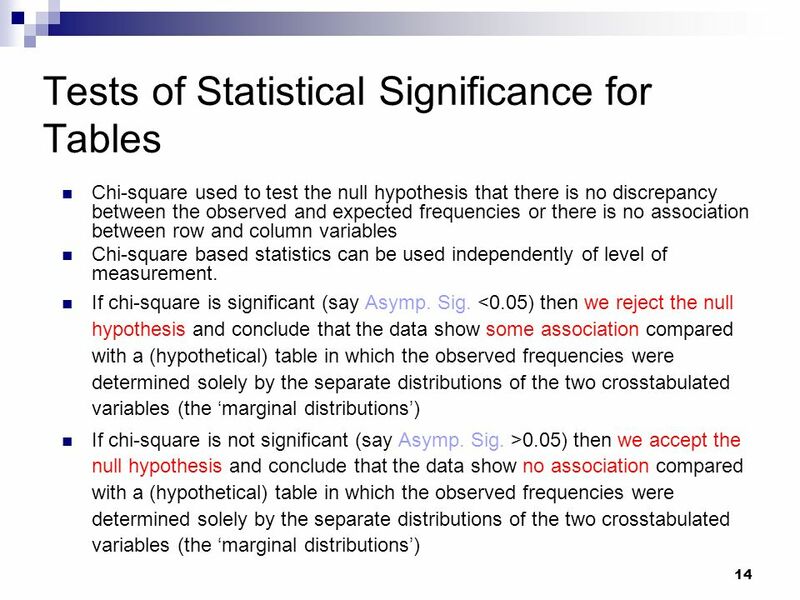 In order to evaluate the correlation between variables, it is important to know the "magnitude" or "strength" as well as the significance of the correlation. . If P>0.05, there is no significant correlation between the two variables. If P<0.05, there is significant correlation between the two variables. 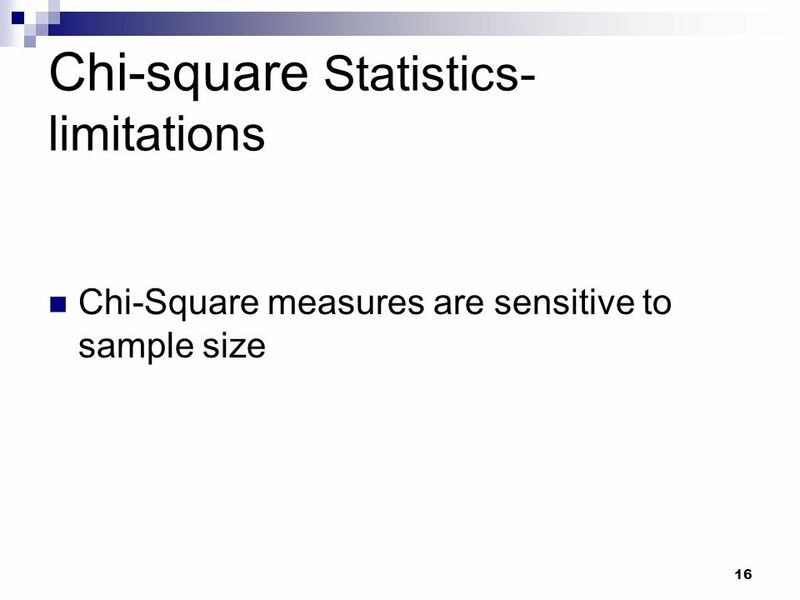 The significance of a correlation coefficient of a particular magnitude will change depending on the size of the sample from which it was computed. The relationship between two variables may be expressed with a number between and This number is called a correlation coefficient. 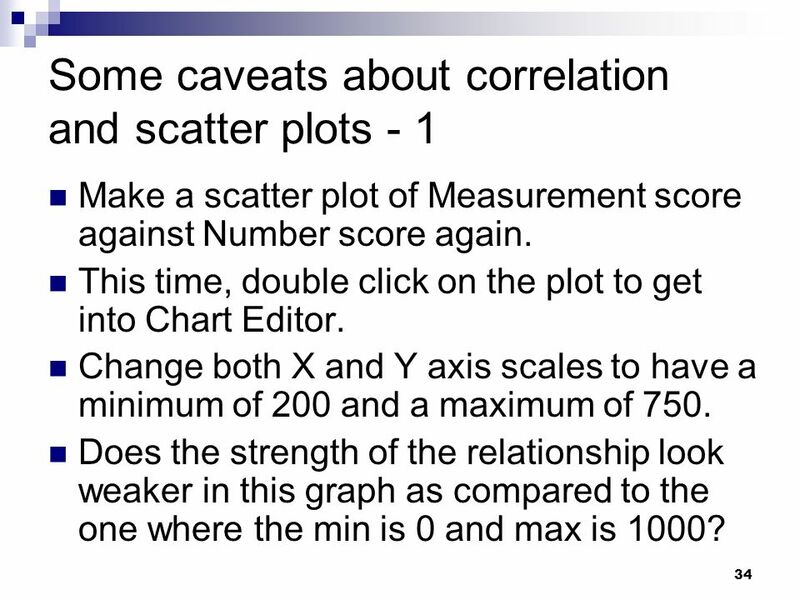 The closer the correlation coefficient is to 0.00, the lower the relationship between the two variables. The closer the coefficient is to 1.00 or the higher the relationship. 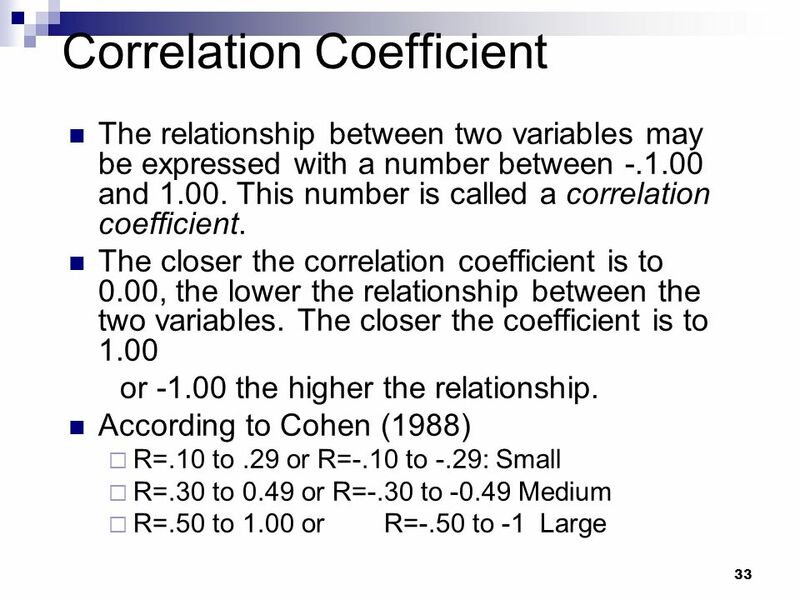 According to Cohen (1988) R=.10 to .29 or R=-.10 to -.29: Small R=.30 to 0.49 or R=-.30 to Medium R=.50 to 1.00 or R=-.50 to -1 Large The Correlation Coefficient indicates the strength of the relationship. Different authors suggest different interpretations. When you interpret the strength of the relationship, it is important to compare your result with those from others. 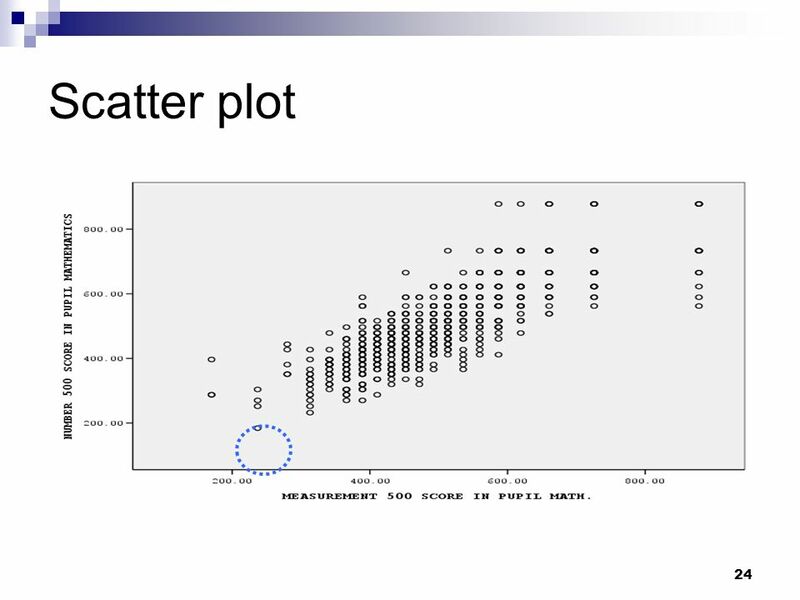 Make a scatter plot of Measurement score against Number score again. This time, double click on the plot to get into Chart Editor. Change both X and Y axis scales to have a minimum of 200 and a maximum of 750. Does the strength of the relationship look weaker in this graph as compared to the one where the min is 0 and max is 1000? 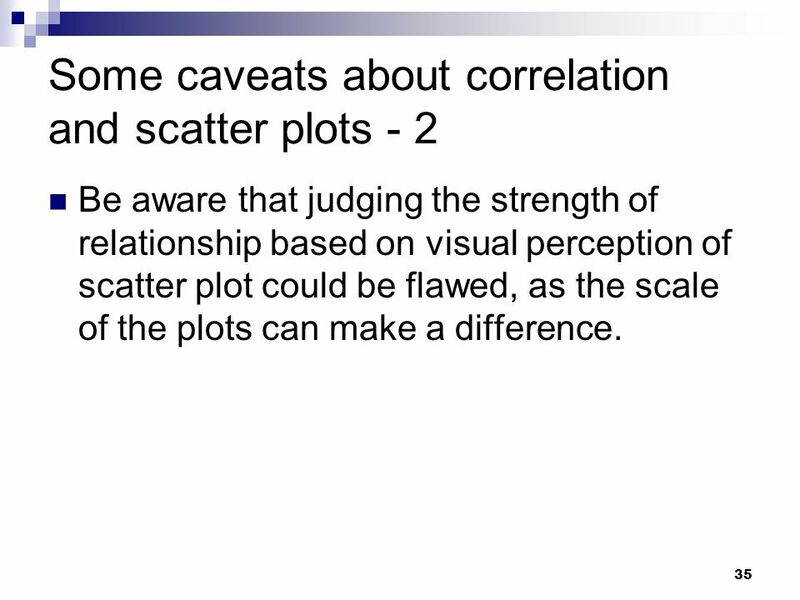 Be aware that judging the strength of relationship based on visual perception of scatter plot could be flawed, as the scale of the plots can make a difference. 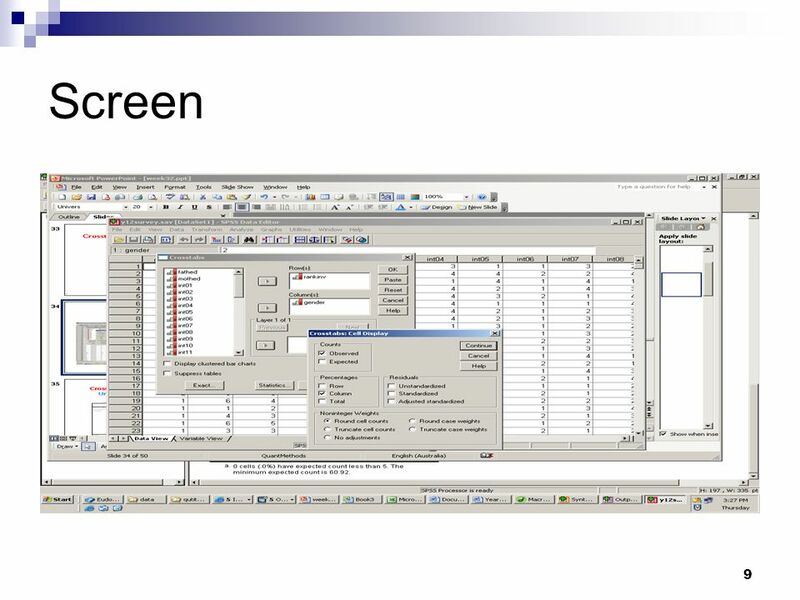 Create a new variable pmes10 using Transform  compute new variable such that pmes10=pmes500/100 +5 That is, we have transformed the measurement score to have a mean of 10 and a standard deviation of 1. 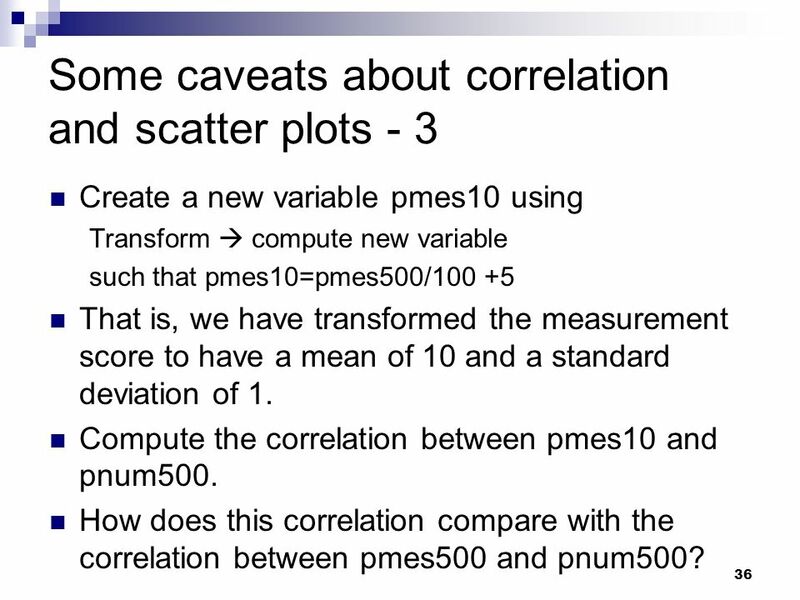 Compute the correlation between pmes10 and pnum500. 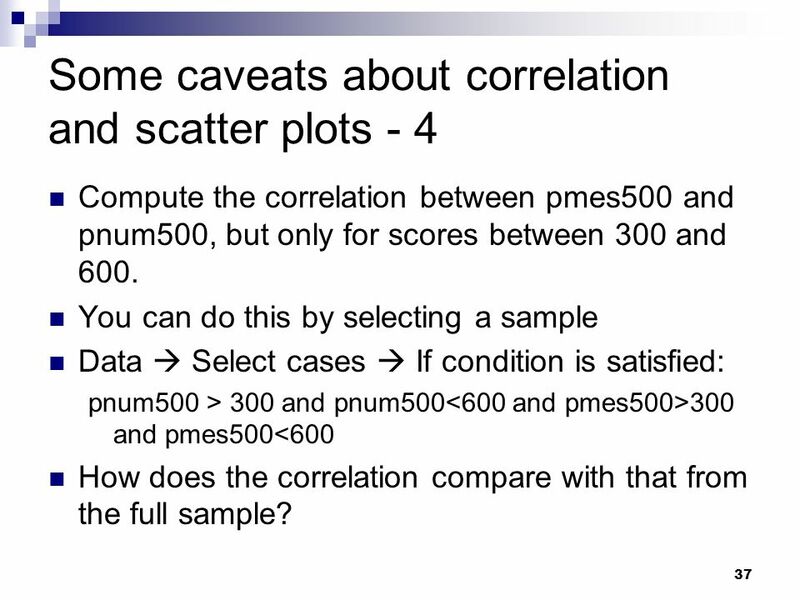 How does this correlation compare with the correlation between pmes500 and pnum500? 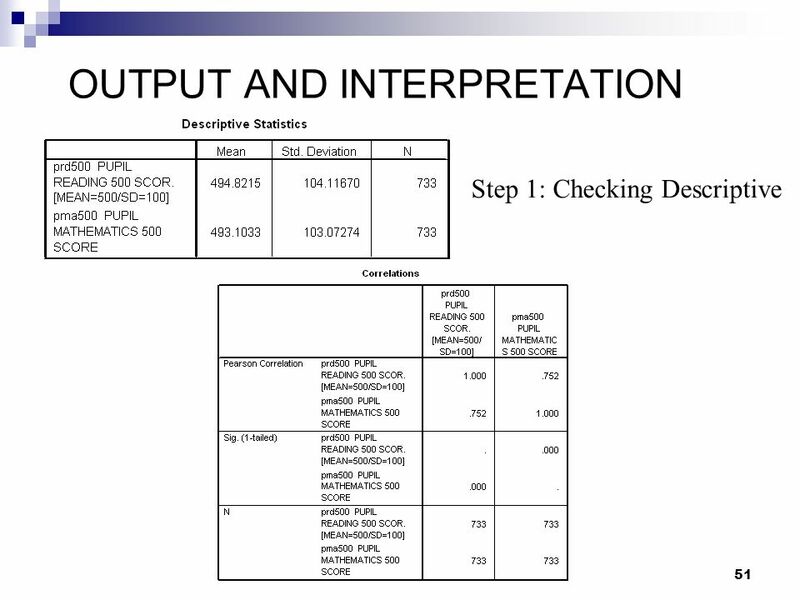 Compute the correlation between pmes500 and pnum500, but only for scores between 300 and 600. 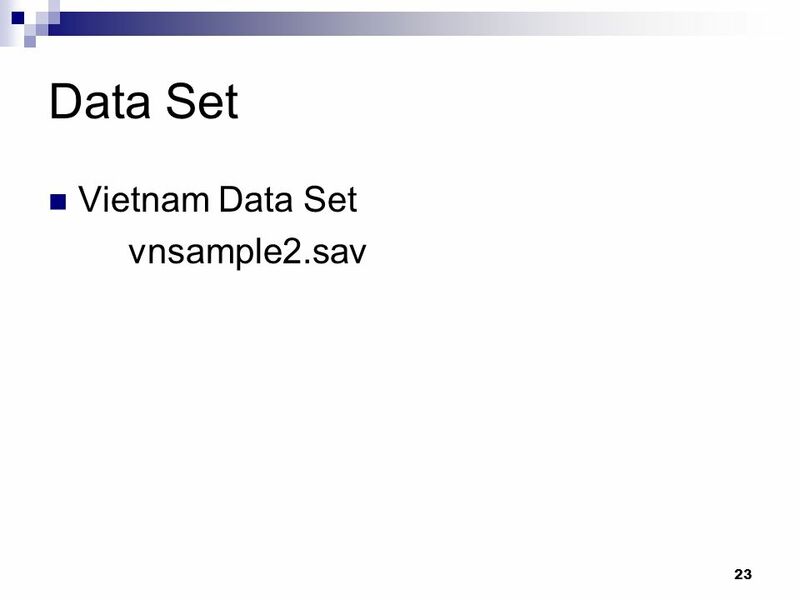 You can do this by selecting a sample Data  Select cases  If condition is satisfied: pnum500 > 300 and pnum500<600 and pmes500>300 and pmes500<600 How does the correlation compare with that from the full sample? This link shows TIMSS and PISA 2003 maths country mean scores for 22 countries. 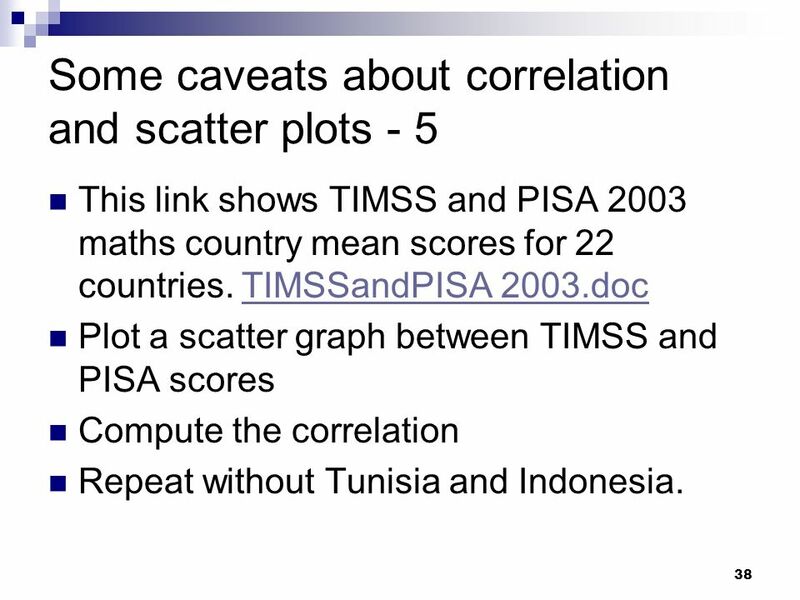 TIMSSandPISA 2003.doc Plot a scatter graph between TIMSS and PISA scores Compute the correlation Repeat without Tunisia and Indonesia. is the squared correlation coefficient, and represents the proportion of common variation in the two variables The correlation coefficient (r) represents the linear relationship between two variables. 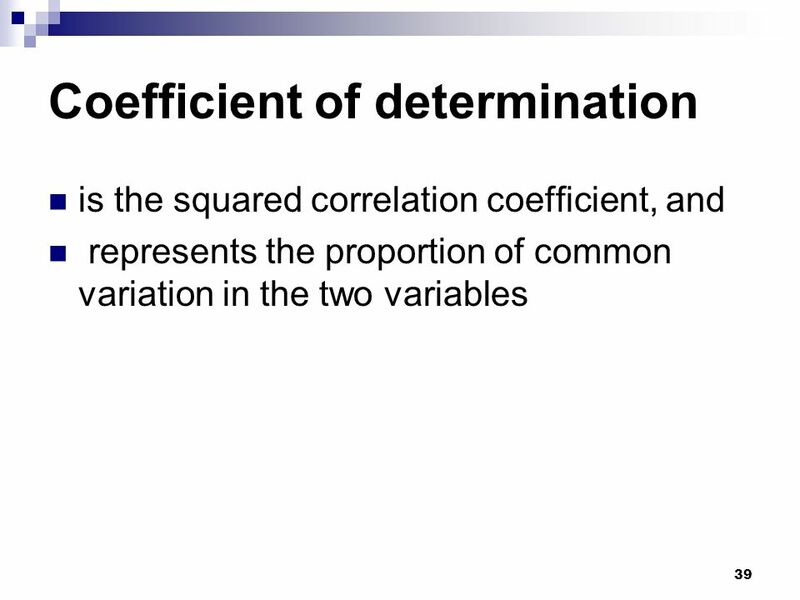 If the correlation coefficient is squared, then the resulting value (r2), the coefficient of determination), will represent the proportion of common variation in the two variables (i.e., the "strength" or "magnitude" of the relationship). 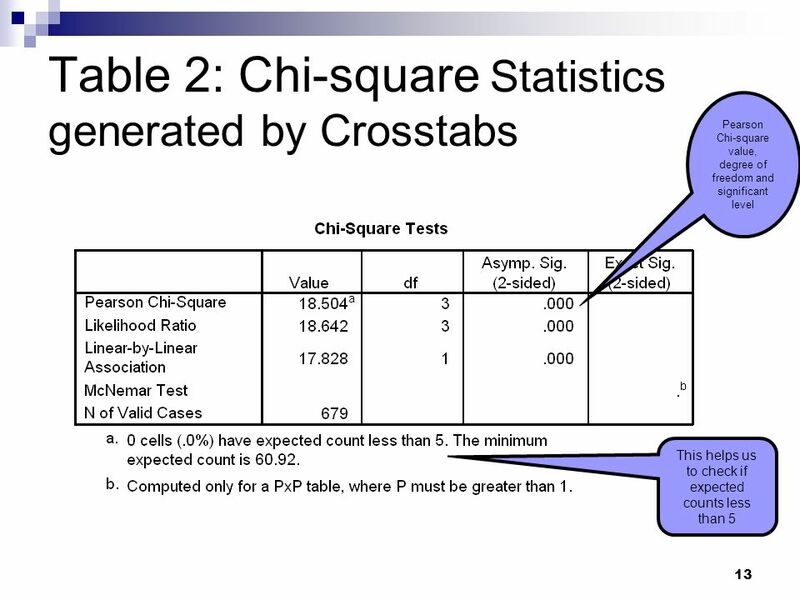 The proportion of variance explained is equal to the square of the correlation coefficient If the correlation between alternate forms of a standardized test is 0.80, then (0.80)2 or 0.64 of the variance in scores on one form of the test is explained or associated with variance of scores on the other form That is, 64% of the variance one sees in scores on one form is associated with the variance of scores on the other form. 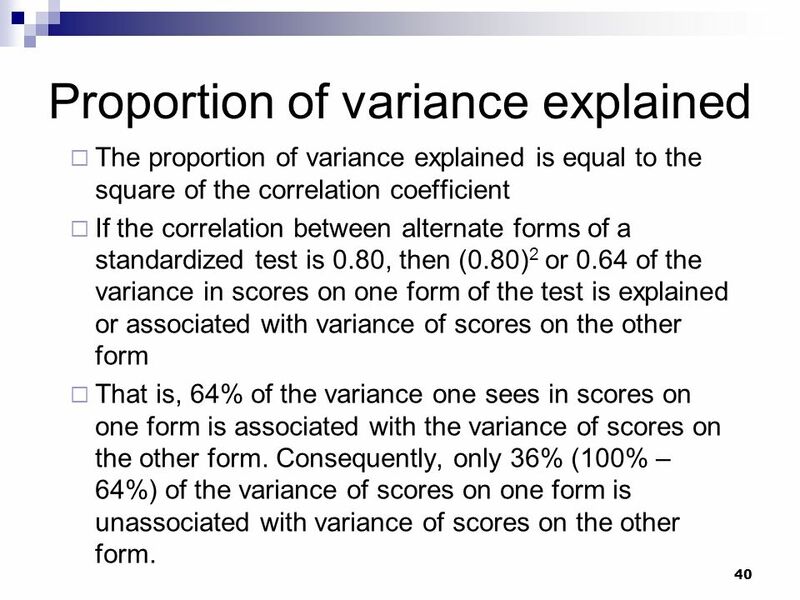 Consequently, only 36% (100% – 64%) of the variance of scores on one form is unassociated with variance of scores on the other form. 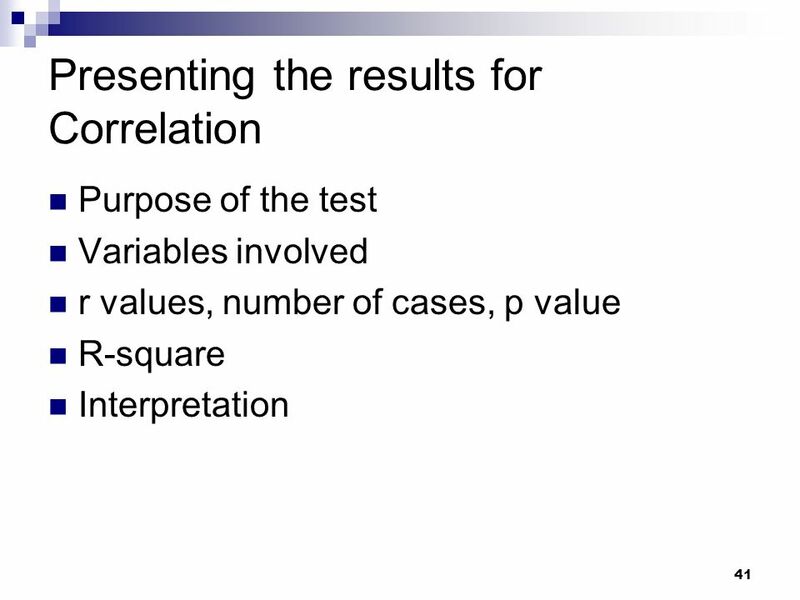 Purpose of the test Variables involved r values, number of cases, p value R-square Interpretation If you examine correlations of a group of variables you can present a correlation matrix. 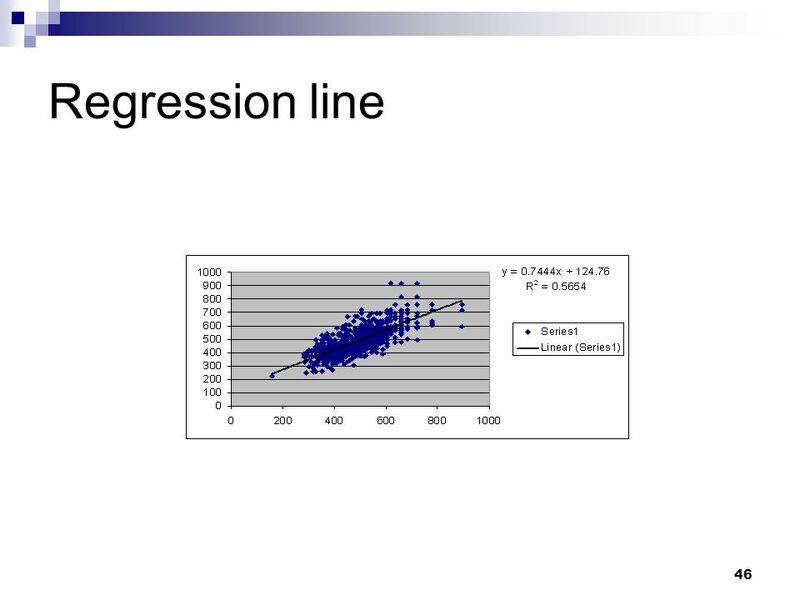 43 Regression line This line is called the regression line or least squares line, because it is determined such that the sum of the squared distances of all the data points from the line is the lowest possible. 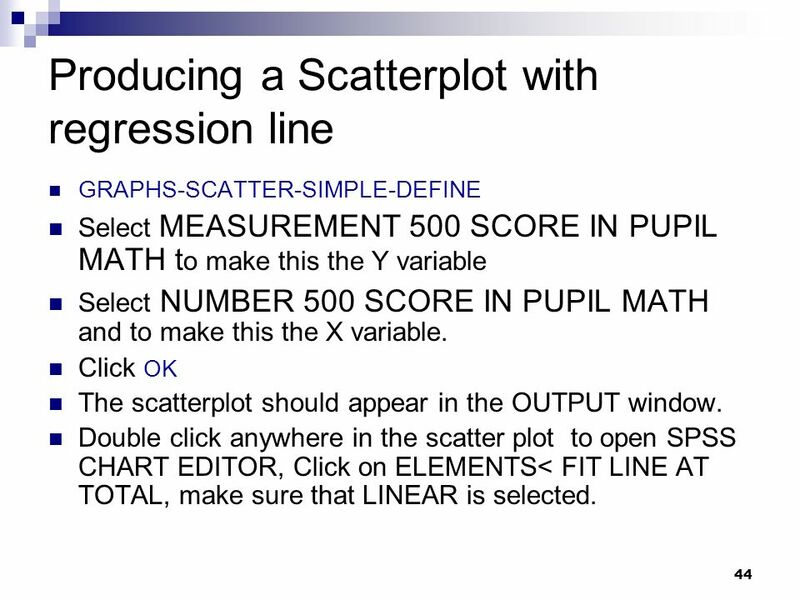 GRAPHS-SCATTER-SIMPLE-DEFINE Select MEASUREMENT 500 SCORE IN PUPIL MATH to make this the Y variable Select NUMBER 500 SCORE IN PUPIL MATH and to make this the X variable. 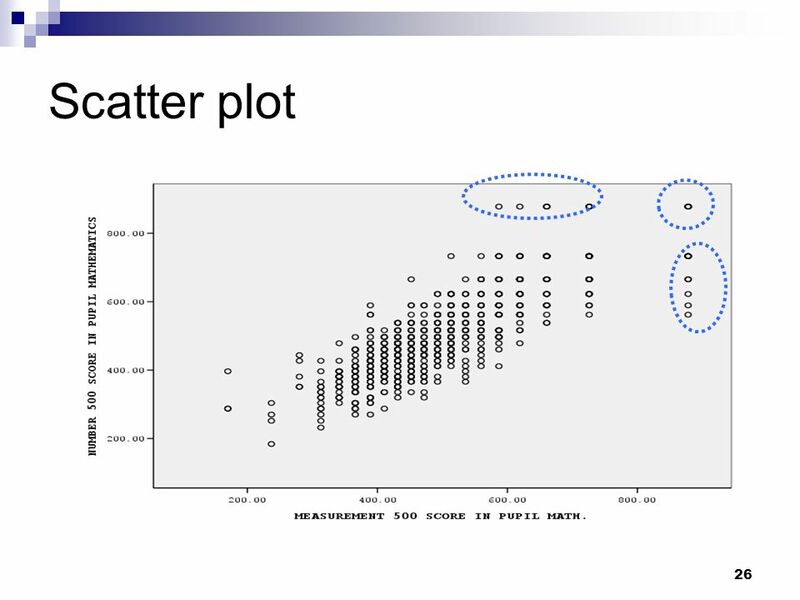 Click OK The scatterplot should appear in the OUTPUT window. 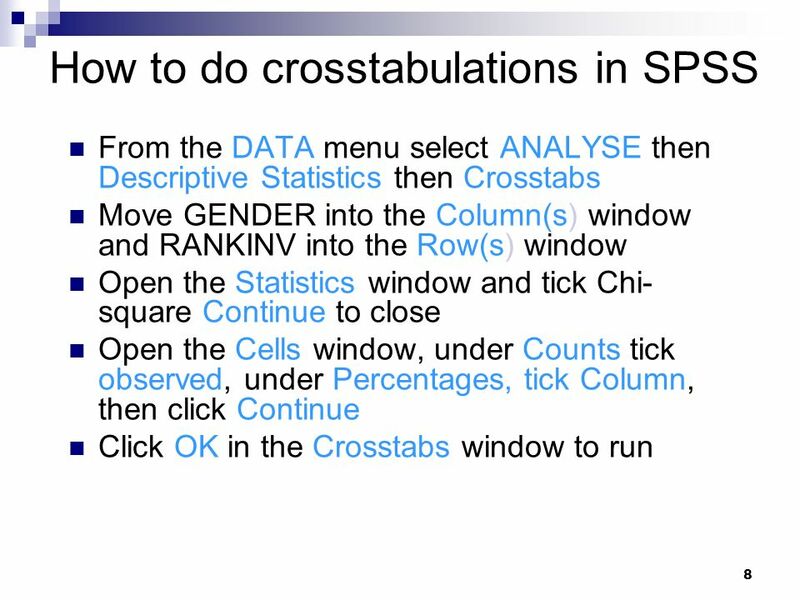 Double click anywhere in the scatter plot to open SPSS CHART EDITOR, Click on ELEMENTS< FIT LINE AT TOTAL, make sure that LINEAR is selected. 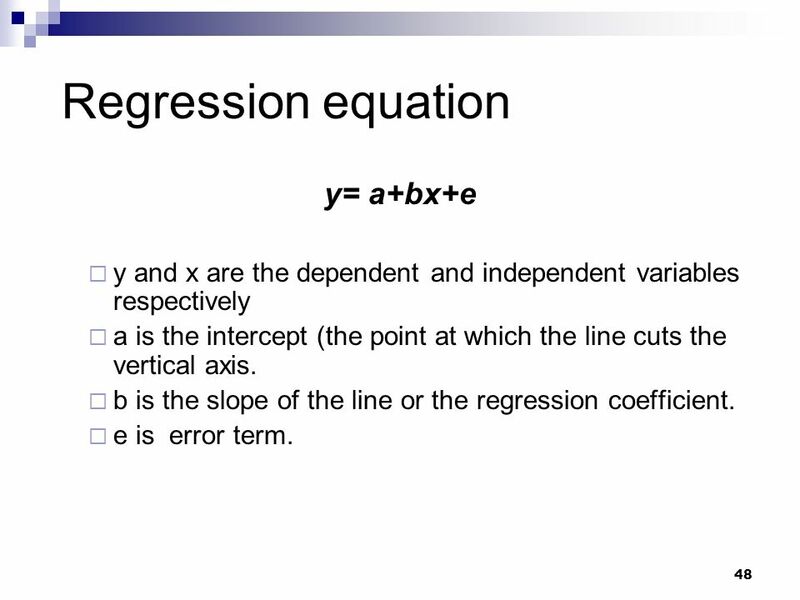 46 Regression line If you draw the regression line in excel, you can get equation included in your chart. y and x are the dependent and independent variables respectively a is the intercept (the point at which the line cuts the vertical axis. b is the slope of the line or the regression coefficient. e is error term. 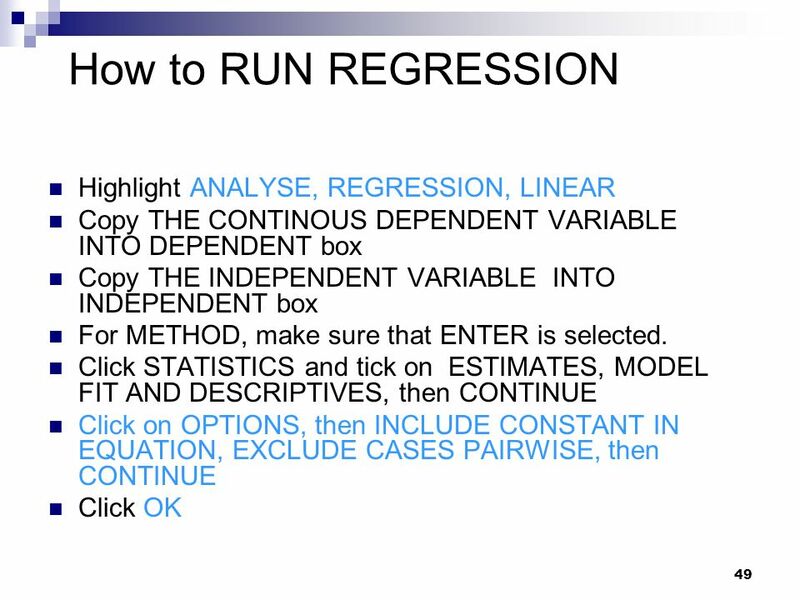 Simple linear regression is a popular tool for describing the relationship between two variables. 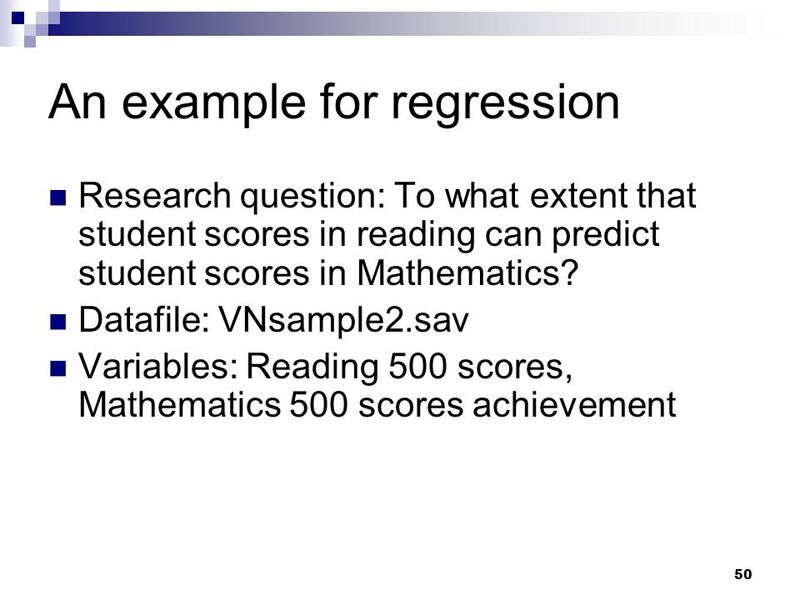 Regression analysis presumes that one variable (y) depends linearly on another variable (x). Linear means that a unit change in the independent variable will result in an expected constant change in the dependent variable. 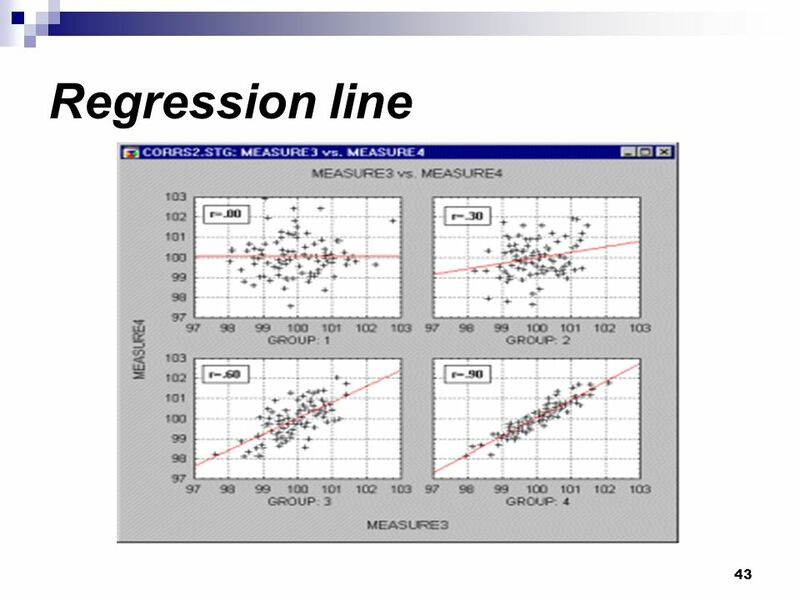 Regression involves finding the line that best represents the relationship between y and x based on sample points (X,Y) Line of best fit . 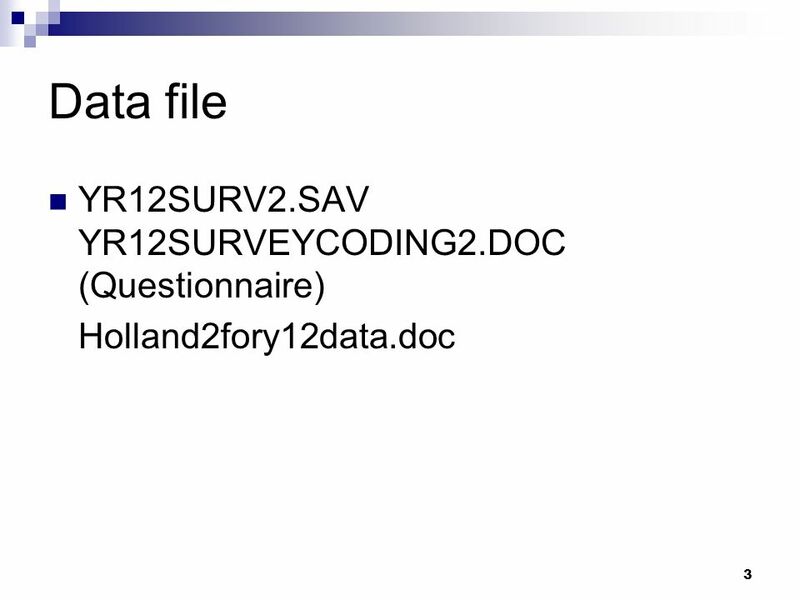 To determine how well the estimated line fits the data, analysis of variance is conducted. 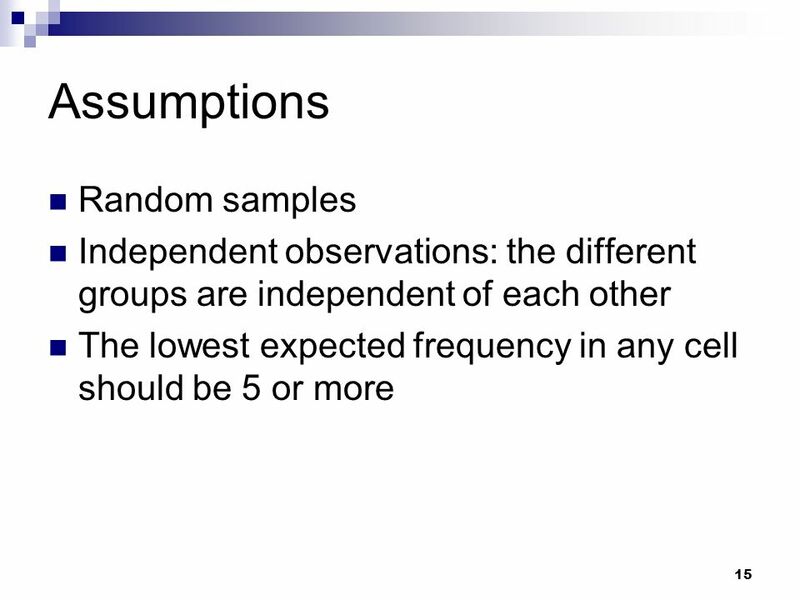 This involves figuring out how much of the variation in y is explained by variation in x and how much is unexplained. In the equation above, y and x are the dependent and independent variables. a is the intercept (the point at which the line cuts the vertical axis. B is the slope of the line or the regression co-efficient. e is error term which shows the proportion of the dependent variable that was not explained by the equation. 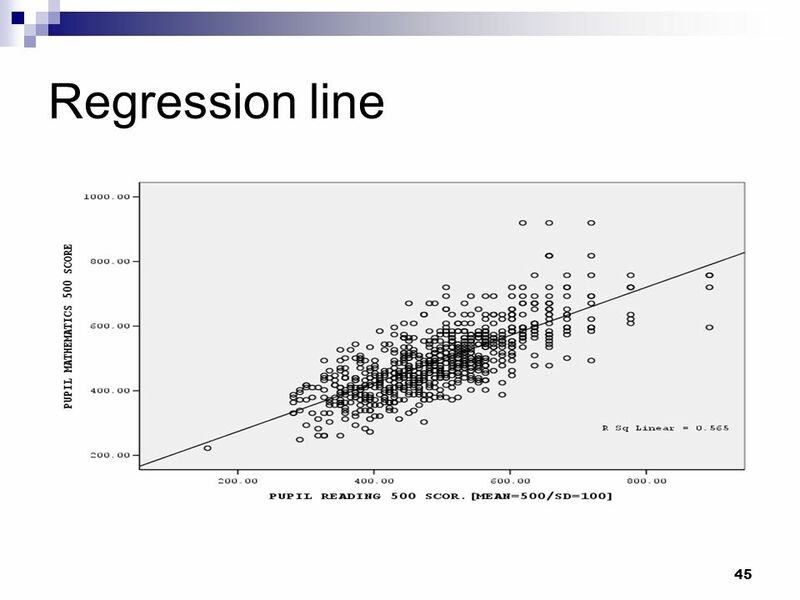 The equation for the line of best fit or regression line is Y=a+bx. It is noted that for a person (i) y_i is often different form Y_i. The regression line is the line where the sum of squared difference of y_m and Y_m is the smallest (m is from 1 to N) or square e is smallest. 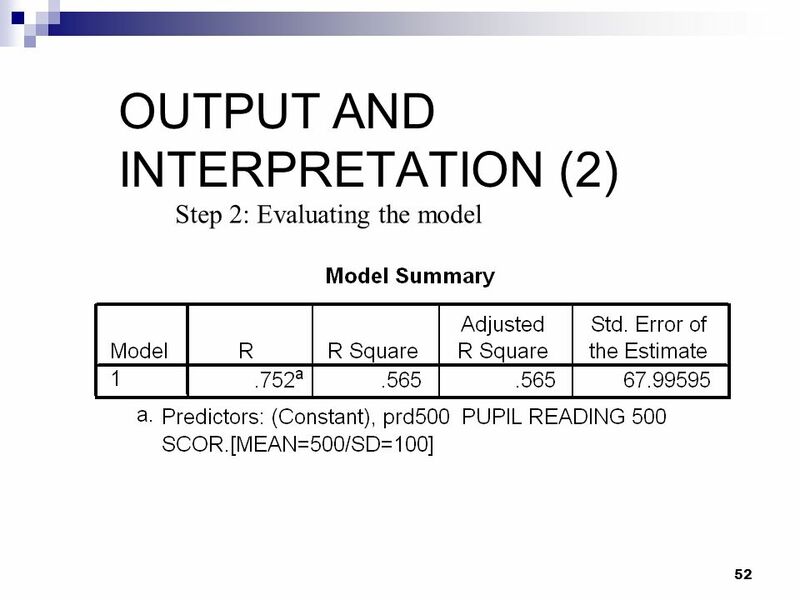 Step 2: Evaluating the model The value of interest in this output is R square. 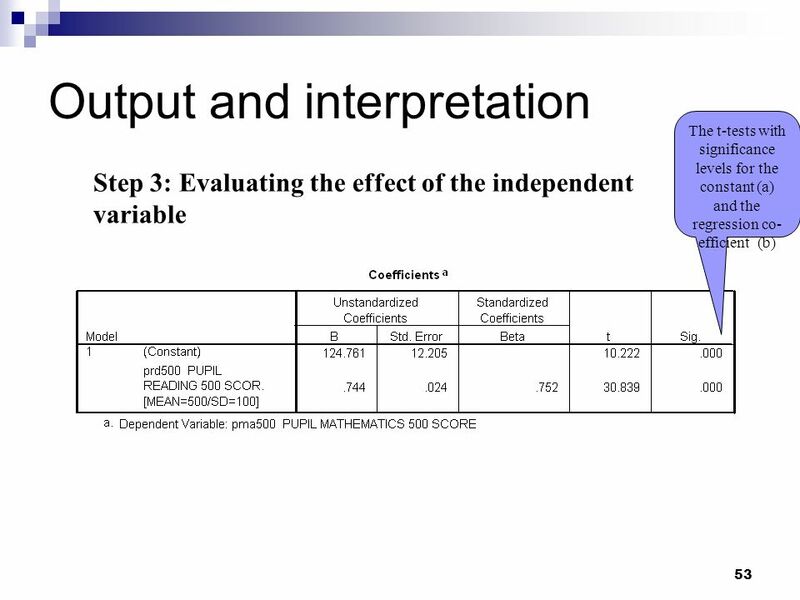 It show how much variable in dependent variable explained by the independent variable. 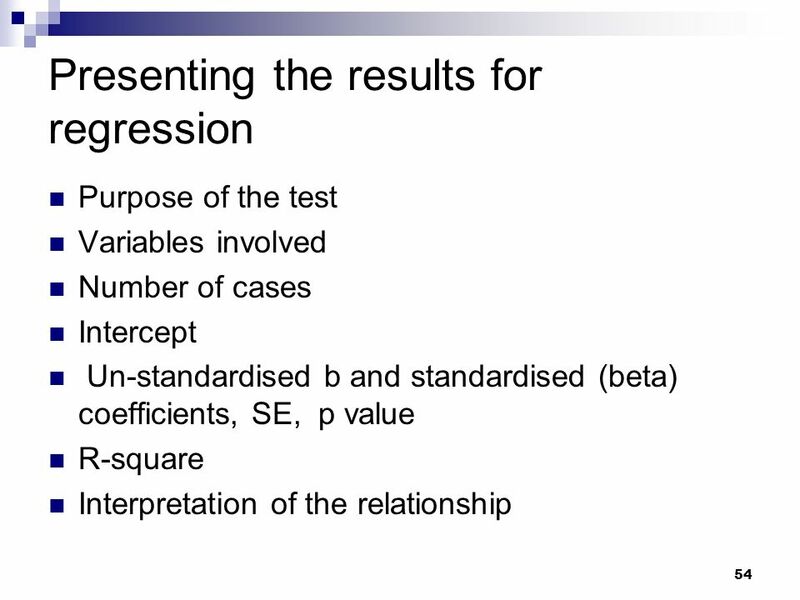 The t-tests with significance levels for the constant (a) and the regression co-efficient (b) Step 3: Evaluating the effect of the independent variable In the column Unstandardised coefficients you can see Constant a and slope b which are the intercept and the slope in your regression equation for the line of best fit: Y= *X. (X is the value of reading scores, Y is the predicted value of Maths scores) The t-tests with significance levels for the constant a and the regression co-efficient b are both significant. This means that the constant a significantly differed from 0; and the effect of X on Y is also significantly differed from 0. 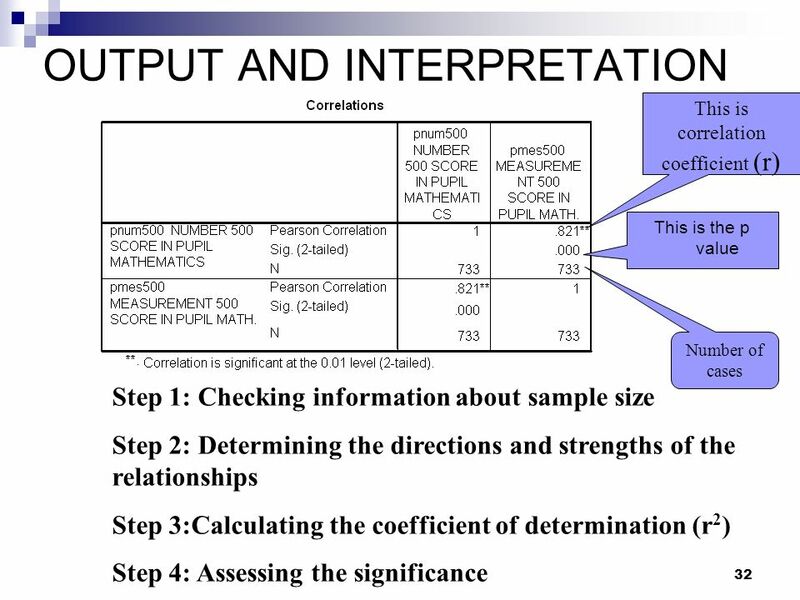 Standardised coefficients are those which have been converted into the same scale so that we can compare them. Standardised coefficients range from (-1 ,0) and (0,1). 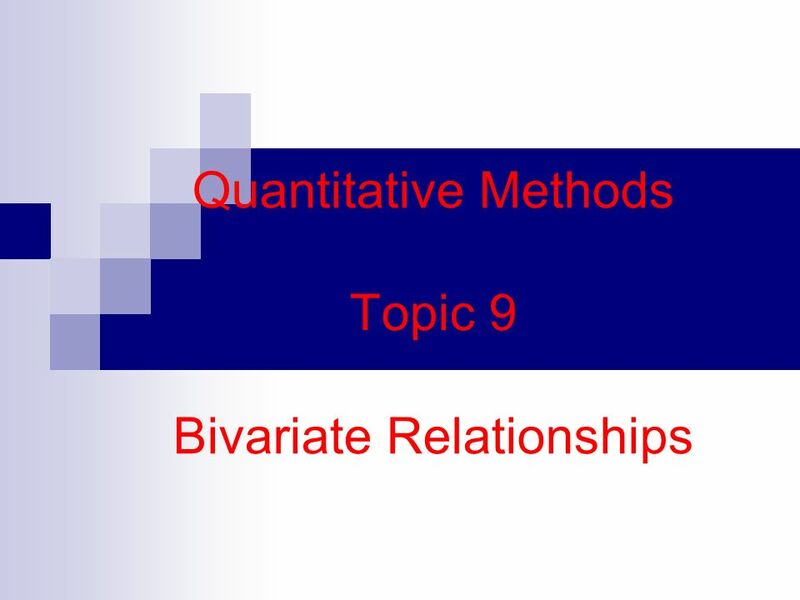 Download ppt "Quantitative Methods Topic 9 Bivariate Relationships"
1 Matters arising 1.Summary of last weeks lecture 2.The exercises 3.Your queries. 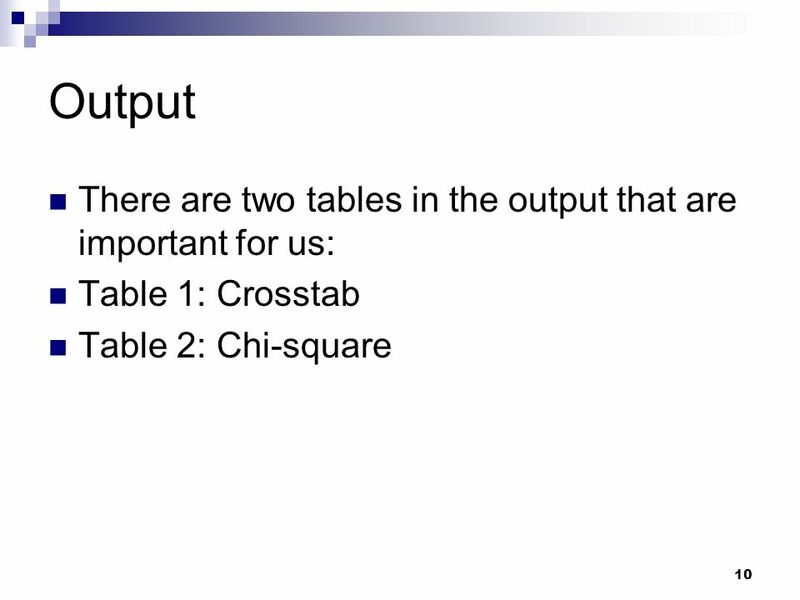 Contingency Tables Prepared by Yu-Fen Li.